Pangaea, Pangæa, or Pangea (from the Greek πᾶν, pan "entire" and Γαῖα, Gaia "Earth"; Latinized as Gæa) is a word coined in 1912 by Alfred Wegener, who is considered to be the father of the modern theory of continental drift. He proposed that the earth was made of a single continentcalled Pangaea, which means "all lands"He proposed that the continents were separated from each other by shallow continental seas effectively making it a supercontinent that was made up of two major landmasses being Laurasia in the north and Gondwanaland in the south. These pieces drifted apart creating the seven continents we have today. Alfred Wegener, a German meteorologist, suggested the first comprehensive theory of continental drift in 1912. He believed that around the Carboniferous period (alleged to have occurred 300 million years ago) the huge Pangaea split. This theory suggests that the continent was composed of light rocks resting on heavier crustal material. Wegener also insinuated that the positions of the plates are not permanent but slowly shifting. He concluded they move at the speed of around one yard every 100 years. Today, most scientists believe that the earth is broken into a number of moving plates that are around about 50 miles thick. They believe these plates to move as much as a few inches per year. 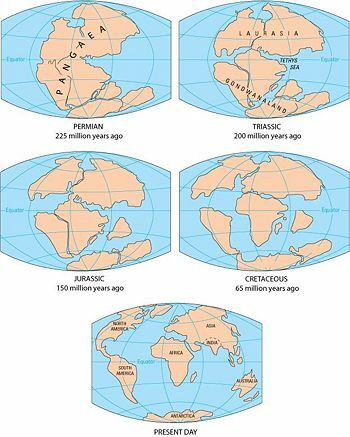 Some creationists and creation ministries such as Answers in Genesis think that Pangea existed at the time of Creation around six thousand years ago. At the time of the Great Flood, they believe the continents were separated into their present day form. ↑ 1.0 1.1 Continental Drift and Plate-Tectonics Theory Information Please® Database, © 2007 Pearson Education, Inc. This page was last modified on 30 September 2014, at 17:02.